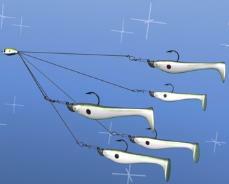 rig is that you can catch multiple fish on one cast. Most of the rigs are fished with a 1/4oz. to 1oz. jig head paired with a swimming minnow. It can be fished in open water at any depth. This technique is not allowed in all states so check your state rules before using. Line: Power Pro 65lb. Braid.